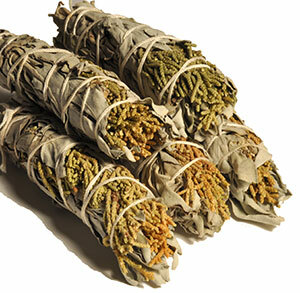 Blended California White Sage and Big Sagebrush smudge bundles add variety to your smudging and incense practices. When burned, both sages are believed to ward off bad spirits, feelings, and energies. Both the California White Sage and Big Sagebrush is wildcrafted in California. Bundles are about 8-9 inches in length and 1¾ inches in diameter. 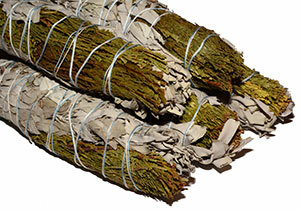 Blended California White Sage and Big Sagebrush smudge bundles add variety to your smudging and incense practices. When burned, both sages are believed to ward off bad spirits, feelings, and energies. Both the California White Sage and Big Sagebrush is wildcrafted in California. These are mini bundles are about 5 inches in length and 1½ inches in diameter. California White Sage is unique among all the sages in the world. Its broad leaves grow in beautiful flower-like clusters that sit atop a silvery stalk. Its scent is unmistakable with a strong, pleasant aroma that evokes the chaparral environment of the mountains of Southern California, the habitat where California White Sage is found. The Cahuilla, a Native American tribe that lived in what is now San Diego and Riverside counties, called white sage qas’ily and used its seeds to make a type of flour. They also used white sage as a cure for colds, preparing the leaves in various manners. 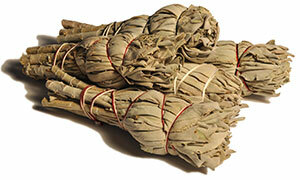 It is also known that white sage was burned, the smoke being used to purify objects. Today, the strong scent of California White Sage is prized for use in smudging, and when burned, is believed to purify people, places, and objects. All of our white sage is wildcrafted from plants growing in the wild. The families we work with work hard to collect the best sage they can find and finely craft our smudge bundles in various sizes. 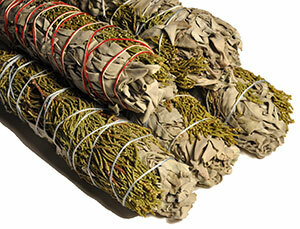 Our sage bundles are offered by size and are graded by approximate length and width. Because each bundle is hand-crafted, there will always be variation. California White Sage is a broad leaf sage and is prized for its strong scent. When burned during smudging, it is believed to purify people, places, and objects. All of our white sage is wildcrafted from the coastal mountains of Southern California. 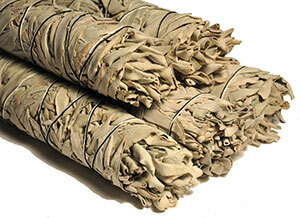 Our mini white sage bundles average about 4 x 1½ inches and are great for one-time use. 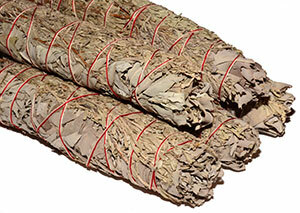 Blended California White Sage and Cedar smudge bundles add variety to your smudging and incense practices. When burned, the strong scent of the broad leaf California White Sage is believed to ward off bad spirits, feelings, and energies. Cedar is believed to attract good spirits and among the Plains Apache, burning cedar is believed to ward off ghosts. Both the white sage and cedar is wildcrafted in California. Bundles are about 9 inches in length and 2 inches in diameter. White sage (Salvia apiana) from the coastal mountains of California. This is a broad leaf sage which is prized for its strong aromatic properties. This sage has the strongest scent of all sages we have. Bulk leaf clusters. We currently have a small amount of white sage "leftovers." These are loose leaves and parts of leaves. There are no clusters, just lots of small pieces. Great for use in potpourri or where the whole clusters are not required. Salvia apiana / Juniperus sp. Blended California White Sage and Juniper smudge bundles add variety to your smudging and incense practices. When burned, the strong scent of the broad leaf California White Sage is believed to ward off bad spirits, feelings, and energies. It is said that among the Cheyenne, juniper needles were sometimes burned to remove fear of thunder. Both the white sage and juniper is wildcrafted in California. Bundles are about 9 inches in length and 2 inches in diameter. 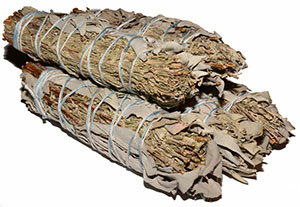 Blended California White Sage and Juniper smudge bundles add variety to your smudging and incense practices. When burned, the strong scent of the broad leaf California White Sage is believed to ward off bad spirits, feelings, and energies. It is said that among the Cheyenne, juniper needles were sometimes burned to remove fear of thunder. Both the white sage and juniper is wildcrafted in California. These are mini bundles and average about 4½ inches long and 1¼ inches wide.